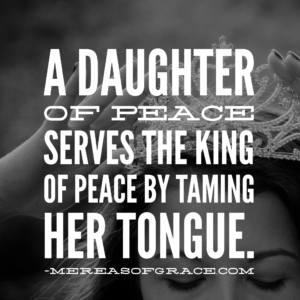 A Daughter of Peace serves the King of Peace by TAMING her tongue. Ya’akov (James) calls this one ‘perfect’. Ya’akov also declares that one who does NOT tame her tongue is 1) self-deceived and 2) her religion is worthless. James 1:26 – If anyone thinks he is religious and does not bridle his tongue but deceives his heart, this person’s religion is worthless. and him who sows strife among brothers. I recently asked my children ‘BY PRACTICE, what religion are you’? I want each of them to consider that their ‘adherence to a set of beliefs’ does not matter if they PRACTICE something altogether different. Holy, Life-Giving SPEECH brought forth an entire world! And unholy speech has its own kind of power as well to deal death, extinguish LIGHT and usher in discord. If we can but understand that G-d’s Delight/Will for us in all our relationships is LIGHT (not darkness), LIFE (not death) and UNITY (not discord), we understand MUCH, and our relationships can begin to HEAL. A ‘whisperer’ separates close friends. This is a much bigger deal to G-d than we know and His Words always bring HEALING. Psalms 107:20 – He sent His word and healed them, And delivered them from their destructions. Matthew 8:8 – But the centurion said, “Lord, I am not worthy for You to come under my roof, but just say the word, and my servant will be healed. Matthew 8:16 – When evening came, they brought to Him many who were demon-possessed; and He cast out the spirits with a word, and healed all who were ill.
Luke 7:7 – for this reason I did not even consider myself worthy to come to You, but just say the word, and my servant will be healed. Do you know that the Greek word for ‘malicious gossips’ in Titus 2:3-5 is DIABOLOS? (Momma’s words are POWER-PACKED one way or another!) And on that note, let me remind you Moms that your children HEAR the way you speak of others in addition to the way you speak TO them. Don’t deceive yourself. Don’t practice worthless religion. Stop whispering and cooperating with the enemy. It’s hard to undo the damage caused by seeds sown in discord; for they quickly take root. SOW SEEDS OF PEACE, Daughter of The KING and thus be a Daughter of Peace by PRACTICE in every respect…and PERFECT!